The goal of the method presented here is to explore protein aggregation during normal aging in the model organism C. elegans. The protocol represents a powerful tool to study the highly insoluble large aggregates that form with age and to determine how changes in proteostasis impact protein aggregation. Groh, N., Gallotta, I., Lechler, M. C., Huang, C., Jung, R., David, D. C. Methods to Study Changes in Inherent Protein Aggregation with Age in Caenorhabditis elegans. J. Vis. Exp. (129), e56464, doi:10.3791/56464 (2017). In the last decades, the prevalence of neurodegenerative disorders, such as Alzheimer's disease (AD) and Parkinson's disease (PD), has grown. These age-associated disorders are characterized by the appearance of protein aggregates with fibrillary structure in the brains of these patients. Exactly why normally soluble proteins undergo an aggregation process remains poorly understood. The discovery that protein aggregation is not limited to disease processes and instead part of the normal aging process enables the study of the molecular and cellular mechanisms that regulate protein aggregation, without using ectopically expressed human disease-associated proteins. Here we describe methodologies to examine inherent protein aggregation in Caenorhabditis elegans through complementary approaches. First, we examine how to grow large numbers of age-synchronized C. elegans to obtain aged animals and we present the biochemical procedures to isolate highly-insoluble-large aggregates. In combination with a targeted genetic knockdown, it is possible to dissect the role of a gene of interest in promoting or preventing age-dependent protein aggregation by using either a comprehensive analysis with quantitative mass spectrometry or a candidate-based analysis with antibodies. These findings are then confirmed by in vivo analysis with transgenic animals expressing fluorescent-tagged aggregation-prone proteins. These methods should help clarify why certain proteins are prone to aggregate with age and ultimately how to keep these proteins fully functional. Protein misfolding and aggregation are recognized as a hallmark of several neurodegenerative diseases such as AD, PD, amyotrophic lateral sclerosis (ALS), frontotemporal dementia (FTD), and many others. For instance, α-synuclein assemblies into amyloid fibrils that accumulate as Lewy bodies particularly in the substantia nigra of PD patients, while in ALS patients TDP-43 or FUS misfold to form cytoplasmic aggregates in degenerating motor neurons. In each of these neurodegenerative disorders, mechanisms maintaining protein homeostasis or proteostasis fail to prevent the accumulation of misfolded proteins, consequently leading to disease. Proteostasis is critical to ensure cellular functions and under normal conditions these regulatory mechanisms tightly control the rate of protein synthesis, folding, and degradation. Several studies demonstrate that with ageing, the ability of many cells and organs to preserve protein homeostasis is gradually compromised and the physiological deterioration of the proteostasis networks with age is an important aggravating factor for neurodegenerative diseases (reviewed in references1,2,3). The fact that the protein quality control and the cellular response to unfolded protein stress are compromised with age suggests that protein misfolding and aggregation could be a general consequence of aging. Indeed, we and others have demonstrated that protein aggregation is not restricted to disease and instead part of the proteome becomes highly detergent-insoluble in aged animals4,5,6,7,8,9,10. Computational and in vivo analysis revealed that these physiological age-related aggregates resemble disease aggregates in several aspects5. The discovery of endogenous, age-dependent protein aggregation gives us the opportunity to dissect the molecular and cellular mechanisms that regulate protein aggregation, without using ectopically expressed human disease-associated proteins. At present, only limited information exists about the regulation of widespread protein insolubility and about the effects of this dysregulation on the health of the organism. The nematode C. elegans is one of the most extensively studied model organisms in aging research as these animals have a relatively short lifespan and show many characteristic aging features observed in higher organisms. The effects of aging on protein insolubility have been studied in C. elegans by sequential biochemical fractionation based on differential solubility, which is widely used to extract disease aggregates in the field of neurodegeneration research11. By quantitative mass spectrometry, several hundred proteins were shown to become aggregation-prone in C. elegans in the absence of disease5. 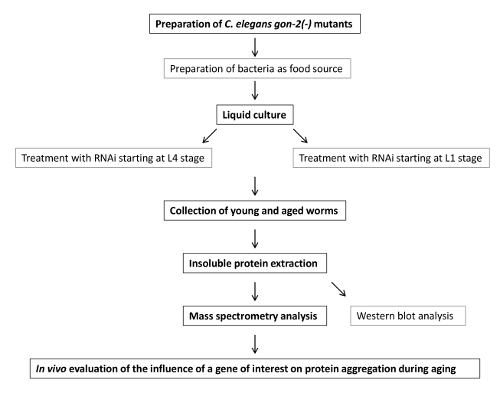 Here we describe in detail the protocol to grow large numbers of worms in liquid culture and the sequential extraction to isolate aggregated proteins for quantification by mass spectrometry and analysis by Western blot. Because misfolded and aggregation-prone proteins accumulate in aged C. elegans gonads and masks changes in other somatic tissues5,12,13, we use a gonad-less mutant to focus the analysis on protein insolubility in non-reproductive tissues. The method presented enables the analysis of highly-insoluble, large aggregates that are insoluble in 0.5% SDS and pelleted by relatively low centrifugal speed. Alternatively, a less stringent extraction protocol to collect also smaller and more soluble aggregates has been published elsewhere10. In addition, we describe the method used to assess aggregation in vivo in C. elegans. Overall, these methods in combination with RNA interference (RNAi) can evaluate the role of a gene of interest in modulating age-dependent protein aggregation. For this we describe the analysis of extracts from young and aged worms with and without knockdown of a specific protein of interest using RNAi. These methods should be a powerful tool to determine which components of the proteostasis network regulate protein insolubility. Several interventions such as reduced insulin/insulin-like growth factor (IGF) 1 signaling (IIS) have been shown to dramatically delay C. elegans aging14. Longevity pathways often induce protein-quality control mechanisms and thus these pathways could be actively influencing the rate of protein aggregation. As an example, we demonstrate reduced inherent protein aggregation in long-lived animals upon inhibition of the IIS pathway7. NOTE: For a better understanding of the procedure, a schematic of the workflow (Figure 1) is attached. NOTE: Use C. elegans temperature-induced sterile gon-2(q388) mutants (CF2253) to obtain large aged-synchronized populations. During all steps, it is important to work under semi-sterile conditions with an open flame and to check that no contaminations (for example, with fungi or bacteria) are present. Perform the steps (also centrifugations) at room temperature if the temperature is not described. NOTE: To obtain sterile animals lacking gonads, the loss-of-function mutation must be induced in the parent animals by shifting these at the last larval stage (L4) to 25 °C in order to avoid maternal contribution. Streak Escherichia coli OP50 strain onto a Lysogeny Broth (LB) plate and incubate it overnight at 37 °C. The next day inoculate 200 mL LB medium with one OP50 clone and incubate it overnight at 37 °C. The next day seed 15 High Growth (HG) medium plates (diameter 9 cm) with 0.5 mL OP50 and distribute OP50 with a spatula. Keep the plates at room temperature for two days. Chunk gon-2(-) animals (not starved for the last two generations) onto 15 HG medium plates seeded with OP50 and maintain them at 20 °C until the plates are confluent with adults and some OP50 is still available. In the meantime, seed 60 HG medium plates with OP50 as described in step 1.1.1.3 and keep the plates at room temperature. Careful: Seeded plates should not be kept for more than one week as the agar will crack at room temperature. Bleach the confluent plates once most adults start to lay eggs as previously described15. Collect eggs in two 15 mL-tubes and place on a nutating mixer overnight at 20 °C. The next day wash hatched L1s with M9 buffer (85 mM NaCl, 42 mM Na2HPO4·7H2O, 22 mM KH2PO4): centrifuge at 3,000 x g for 30 s, discard the supernatant, and fill up to the 15 mL mark with M9. Centrifuge, discard the supernatant, and repeat the step 1.1.1.6. Fill the tubes with the resulting worm pellets up to the 15 mL mark with M9. Evaluate the total number of L1s with a dissection microscope by counting the L1s present in 2 µL drops placed on non-seeded agar plates. Average the numbers obtained from at least nine drops. Add 6,500 L1s per seeded HG plate and let the worms grow at 20 °C until L4 stage. At L4 stage, shift the worms from step 1.1.1.9 to 25 °C until they start to lay eggs and L1s are hatching. NOTE: After the temperature shift to 25 °C, it is preferable to use sedimentation as a gentle technique to separate the fragile eggs and L1s from the adults. Wash the plates with M9 by using 5 mL M9 per five plates. Transfer the worms into 50 mL tubes. Fill up all tubes to the 45 mL mark with M9, let the adults sediment for approximately 10 min, collect each supernatant in a 50 mL tube, and repeat this step with the pellet. Centrifuge the supernatant that contains eggs and L1s at 3,000 x g for 1 min, let the L1s sediment for approximately 10 min, and remove the supernatant until 15 mL are left. NOTE: This is a critical step. Do not remove the supernatant too early, to collect as many L1s as possible. Place the tubes containing eggs and L1s on a nutating mixer overnight at 25 °C. NOTE: The response of some genes to RNAi can be temperature dependent as previously described16. As an alternative to RNAi, a mutant gene could be incorporated into the gon-2(-) background. Prepare OP50 and RNAi bacteria (bacteria producing the desired dsRNA and bacteria with the empty vector as control) by inoculating 4 L LB medium with 12 mL of the respective bacterial culture (add a final concentration of 50 µg/mL carbenicillin and 1 mM IPTG to the RNAi bacterial cultures) and incubate them at 37 °C overnight at 180 rpm. The next day harvest the cultures at 6,700 x g for 10 min at 4 °C. Remove the supernatants and resuspend each pellet in 60 mL ice-cold S basal media (100 mM NaCl, 50 mM Potassium phosphate pH 6, kept on ice). Keep the three resuspended pellets (OP50, control RNAi bacteria, and RNAi bacteria for the gene of interest) at 4 °C until step 1.2.2 or 1.2.3. NOTE: Worms can be grown on RNAi from L1 stage (see step 1.2.3) or to avoid developmental defects from the last larval stage L4 (see step 1.2.2). Add 200 mL S basal media in a Fernbach culture flask (capacity 2,800 mL). For a final culture volume of 300 mL (see 1.2.2.4), add 10 mM potassium citrate, pH 6, 3 mL Trace metals solution (5 mM ethylenediaminetetraacetic acid (EDTA), 2.5 mM FeSO4, 1 mM MnCl2, 1 mM ZnSO4, 0.1 mM CuSO4), 3 mM MgSO4, 3 mM CaCl2, 100 ng/mL carbendazim, and 5 µg/mL cholesterol). Close the flask with a membrane screw cap. Refer to Table 1 for recipes of buffers. Take the L1s out of 25 °C (step 1.1.2.2.3) and transfer them to 15 mL tubes. Centrifuge at 1,900 x g for 3 min, remove the supernatant, and count the L1s per 2 µL as in step 1.1.1.8. Add 500,000 L1s into the Fernbach culture flask prepared in the previous step. Add OP50 (from step 1.2.1) proportionally to the number of worms. For example, for 500,000 worms add 60 mL OP50. Complete worm culture with S basal to bring the total volume to 300 mL. Incubate the worm culture until L4 stage at 25 °C in a shaking incubator with 150 rpm. The next day, the worms should be the size of wild-type L4s. To change from OP50 to RNAi bacteria, collect animals in six 50 mL-tubes, let them sediment and remove the supernatant. Wash the L4s with M9 to remove residual OP50 bacteria: centrifuge at 1900 x g for 3 min, remove the supernatant and transfer all L4s into one 50 mL-tube. Count the L4s per 5 µL (at least nine times). Two times 50,000 L4s are needed for the young worm collection and two times 100,000 L4s are needed for the aged worm collection. Prepare four Fernbach culture flasks as described in 1.2.2.1. Add also a final concentration of 50 µg/mL Carbenicillin and 1 mM IPTG to each flask. 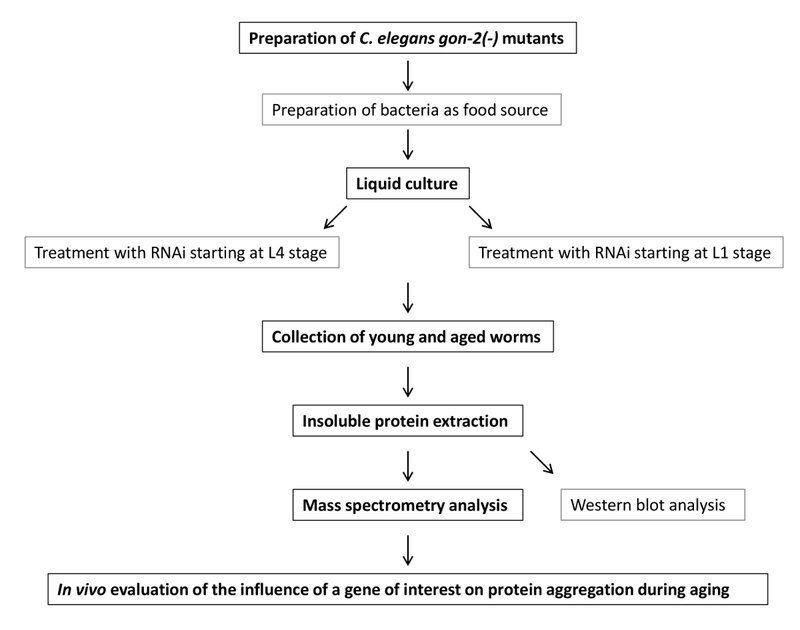 Add control RNAi bacteria and RNAi bacteria for the gene of interest (from step 1.2.1) proportionally to the number of worms: Add 7 mL of the respective bacteria per flask for young worms and 14 mL per flask for the aged worms. Add 50,000 worms per flask for the young worm collection and 100,000 worms per flask for the aged worm collection, and complete the cultures with S basal to fill up to 300 mL. Incubate the worm cultures (four in total) at 25 °C and 150 rpm. Prepare four Fernbach culture flasks as described in 1.2.2.1 and add a final concentration of 50 µg/mL carbenicillin and 1 mM IPTG. Continue with the preparation of L1s as described in 1.2.2.2. In total, 300,000 worms are needed to divide them into four flasks. Add control RNAi bacteria and RNAi bacteria for the gene of interest (from step 1.2.1) proportional to the number of worms as described in step 1.2.2.7 and consider also the growth phase between the L1 and L4 stage: Add 13 mL of the respective bacteria per flask for young worms and 26 mL per flask for the aged worms. Continue as described in step 1.2.2.8. Periodically collect an aliquot from each liquid culture and place on a glass slide (alternatively on an agar plate) to verify that there are no contaminations. Using a dissection microscope, check the bacterial food levels in the culture especially during the growth phase. Prepare in advance 2 L cultures of control RNAi bacteria and RNAi bacteria for the gene of interest as described in step 1.2.1. Add these to C. elegans liquid cultures if necessary and keep the rest at 4 °C. Periodically check that the animals are sterile. The majority of animals will not have a gonad. Depending on the penetrance of the gon-2 mutation, some may have aborted gonadal structures but no animals with eggs should be observed. NOTE: All of the following steps are for one liquid culture flask but both cultures of the same age with control and RNAi bacteria for the gene of interest should be processed together. Collect young worms at day 2 or day 3 to measure basal levels of protein insolubility. Aged worms should be collected (at the latest) when half of the population has died. To determine this, dead and alive worms are counted in several drops of liquid culture placed on an agar plate. Ratios are averaged over at least nine drops. Prepare the following reagents: 1 L M9, 1 L M9 with 0.01% Octoxynol-9 (M9 + Octoxynol-9), and 40 mL 60% sucrose in ddH2O. Keep the reagents on ice. Pour the worms from one flask into a separation funnel and let the worms sediment for 10 min at room temperature. Open the stopcock and drip the worms into one 50 mL tube. Split the worm pellet into two 15 mL-tubes and centrifuge at 1,900 x g for 5 min at room temperature. To wash the worms, remove the supernatant and fill up to 15 mL with M9. Repeat the centrifugation. Finally transfer the worms to two 50 mL tubes and fill up to 20 mL total volume with ice-cold M9. To remove bacteria and dead worms, add the two 20 mL diluted worm pellets to two 50 mL-tubes filled with 20 mL ice-cold 60% sucrose. Quickly centrifuge at 2,700 x g for 5 min at room temperature, acceleration 9 and deceleration 7. Carefully remove the top worm layer with a large pipet (25 mL). Take up to 15 mL (but less if there are obviously a lot of dead worms). Put this directly into 37 mL of M9 + Octoxynol-9 (3 tubes per sucrose tube) prepared on ice. Centrifuge at 2,700 x g for 3 min at room temperature, acceleration 9 and deceleration 7. NOTE: Both need to be ice-cold; otherwise the separation will not work. Do not mix! Because sucrose is toxic to the worms it is important to be quick for the following step. Divide the pellet into four 15 mL-tubes and wash twice with ice-cold M9+ Octoxynol-9: centrifuge at 1,900 x g for 1 min at room temperature. Remove supernatant, fill up to 15 mL mark with ice-cold M9+Octoxynol-9 and repeat procedure. Wash once with ice-cold M9 and combine the four tubes to two tubes. Fill up with M9 at room temperature to a total volume of 4 mL in the 15 mL-tubes and rotate on a nutating mixer at 25 °C for 40 min. NOTE: This helps the worms to digest any residual bacteria in the gut. Check the worms under the microscope to see that there are no dead ones. Wash the worms twice with ice-cold M9+Octoxynol-9 as described in 1.3.5. Wash twice with M9 and transfer the worms to one tube. Wash the worms once in the Reassembly (RAB) high-salt extraction buffer without inhibitors (0.1 M 4-morpholineethanesulfonic acid (MES), 1 mM ethyleneglycoltetraacetic acid (EGTA), 0.1 mM EDTA, 0.5 mM MgSO4, 0.75 M NaCl, 0.02 M sodium fluoride (NaF)) before collection. Remove the supernatant until there is no liquid on top of the worm pellet. NOTE: This step and the next one should be done rapidly to avoid artifacts in the worms caused by the high salt concentration in the buffer. Estimate the volume of worm pellet and add an identical volume of RAB with inhibitors (2x Protease Inhibitor Cocktail). Using a Pasteur pipette, draw up the worms and slowly drip into a 50 mL tube half filled with liquid nitrogen placed in dry ice. Let the liquid nitrogen evaporate and store the frozen worms at -80 °C until further processing. Caution: Liquid nitrogen is at an extremely low temperature; wear appropriate protection. NOTE: It is important to avoid any thawing of the worm samples. Cool down the mortar with liquid nitrogen and perform the complete procedure on dry ice. Transfer the frozen worms to the pre-cooled mortar and grind for 2.5 min. NOTE: Be careful during the grinding: at the beginning, the frozen worms are in small bullets and it is easy to lose them. Add liquid nitrogen (approximately 100 mL) to the powder to cool it down again and grind for another 2.5 min. Check with the microscope that the worm bodies are broken. Transfer the powder into 2 mL tubes and store them at -80 °C. Note: Use this method to compare the total protein content and insoluble protein levels between the different days with and without RNAi targeting the gene of interest. Perform all steps until step 2.2.3 on ice! Solubilize 50 mg of ground worms from step 2.1 with 150 µL Radioimmunoprecipitation assay (RIPA) buffer (50 mM Tris pH 8, 150 mM NaCl, 5 mM EDTA, 0.5% sodium dodecyl sulfate (SDS), 0.5% sodium deoxycholate (SDO), 1% nonylphenylpolyethylenglycol (NP40), 1 mM phenylmethylsulfonyl fluoride (PMSF), 1x Protease Inhibitor Cocktail). Homogenize the suspension using a 1 mL syringe with gray needle (27 G x ½", 0.4 mm x 13 mm); draw up the suspension 10 times. Centrifuge at 18,400 x g for 20 min at 4 °C. Collect the supernatant. Resuspend the pellet in 100 µL RIPA buffer and centrifuge at 18,400 x g for 20 min at 4 °C. Discard the supernatant, spin shortly, and be careful to remove leftover supernatant. To solubilize the highly insoluble proteins, resuspend the pellet in 75 µL Urea/SDS buffer (8 M urea, 2% SDS, 50 mM dithiothreitol (DTT), 50 mM Tris, pH 8) and incubate for 10 min at room temperature. To analyze the total protein content, combine the first RIPA supernatant from step 2.2.2 and the Urea/SDS pellet resuspension. To account for the volumes used for the extraction, the total fraction should contain two thirds of RIPA supernatant and one third of Urea/SDS pellet fraction. On a small 4-12% gradient gel, check the levels of insoluble protein by loading 9 µL of the Urea/SDS fraction and 4 µL total combined protein. Perform a total protein blot staining to monitor protein levels. By Western blotting using specific antibodies, verify changes in insolubility for individual proteins quantified by mass spectrometry (see Section 3). NOTE: Perform all steps on ice. On dry ice weigh out two times 350 mg ground worms per time point and per RNAi bacteria (young and aged worms, control RNAi bacteria, and RNAi bacteria for gene of interest) into 2 mL tubes. To remove the high-salt soluble proteins, add two volumes of RAB per weight (700 µL) with inhibitors, 1 mM PMSF, 200 U/mL DNase I, and 100 µg/mL RNase A to each tube and solubilize the powder on ice. Draw up the suspension into a 1 mL syringe (gray needle, 27 G x ½", 0.4 mm x 13 mm) 15 times and incubate it on ice for 10 min. Centrifuge at 18,400 x g for 20 min at 4 °C. Go through the fat layer and collect the supernatant containing high-salt soluble proteins into one 2 mL tube per condition (four tubes in total). Remove the fat and discard it. Aliquot high-salt soluble proteins to freeze at -80 °C. To discard lipids, solubilize the pellet with 700 µL RAB with inhibitors containing 1 M sucrose (without DNase I and RNase A). Draw up the suspension into a syringe 10 times and incubate it on ice for 5 min. Centrifuge at 18,400 x g for 20 min at 4 °C. Be careful to remove all supernatant and lipids and discard them. To remove SDS-soluble proteins, solubilize the pellet with 700 µL RIPA buffer. Draw up the suspension into a syringe 10 times and incubate it for 10 min on ice. Centrifuge at 18,400 x g for 20 min at 4 °C. Collect the supernatant containing SDS-soluble proteins and aliquot for freezing at -80 °C. Pool two samples of each condition together after solubilizing each pellet with 500 µL RIPA buffer. Draw up the suspension into a syringe 10 times. Centrifuge at 18,400 x g for 20 min at 4 °C. Be careful to remove all supernatant and discard it. NOTE: The goal of the extraction is to separate the soluble proteins from the insoluble proteins. Therefore, it is important to remove all residual RIPA supernatant before adding formic acid in the next step. Solubilize the final pellet containing highly insoluble proteins with 400 µL 70% formic acid and draw up the suspension into a syringe 20 times. Incubate for 20 min on ice. Centrifuge at 50,000 x g for 20 min at 4 °C, acceleration 3 and deceleration 5, to remove worm cuticle debris. Collect the supernatant that contains highly insoluble proteins and freeze it at -80 °C. NOTE: Dialyze at 4 °C. Prepare 8 L dialysis buffer (50 mM Tris, 1 mM DTT, 0.1 mM PMSF, pH 7.5) and divide it to eight 1 L beakers. Place three membranes (membrane filters = 0.025 µM) on the buffer surface for each 1 L beaker. Per membrane, carefully load 65 µL of insoluble protein solubilized in formic acid obtained in step 2.3.6. Each condition is divided onto six membranes. Check the pH of one sample by removing 5 µL and adding it onto a pH strip. If the pH is between 7 and 8 (approximately after 2 h), collect the sample by pipetting up and down gently. Finally, use 10 µL dialysis buffer to wash the precipitate off each membrane. Freeze samples at -80 °C. Evaluate the amount of insoluble proteins in the dialyzed samples by loading an aliquot onto a 4-12% gradient gel together with a reference sample of known concentration. Perform a total protein gel staining and quantify the protein amount with an image analysis software. This step is necessary to estimate the amount of trypsin needed for the digestion (step 3.1.4). Concentrate the samples using a centrifugal evaporator and solubilize the insoluble proteins in a final concentration of 8 M urea. Add Tris(2-carboxyethyl)phosphine hydrochloride (TCEP) to a final concentration of 4 mM to the samples. Incubate for 1 h at 57 °C with 300 rpm. Put the samples to room temperature. Add iodoacetamide to a final concentration of 8.4 mM. Incubate it for 45 min (can be incubated for 2 h) in the dark at room temperature. Dilute the samples in 150 mM ammonium bicarbonate to obtain a final 2 M urea concentration. Digest proteins with 5% w/w modified trypsin overnight at 37 °C and 400 rpm. Load a sample of the digested proteins on a 12% SDS gel and perform a total protein gel staining to analyze if the digestion worked. If there are still some bands present, repeat steps 3.1.4 and 3.1.5. Peptides from young and aged control and RNAi treated C. elegans are labeled with isobaric tags for relative and absolute quantitation following the manufacturer's instructions. NOTE: Alternatively, other methods for labeling the peptides or proteins could be used for quantification such as tandem mass tags. NOTE: Mass spectrometry analysis: To reduce sample complexity, peptides should be separated by strong cation exchange chromatography into different fractions for mass spectrometry analysis5. Several mass spectrometers are capable of analyzing isobaric tags for relative and absolute quantitation as described elsewhere17. The data obtained should be processed with appropriate software. Overall this analysis allows the identification of highly insoluble proteins and their changes upon age and upon proteostasis modulation. From the mass spectrometry analysis in Section 3, select an age-dependent aggregation-prone protein that accumulates to a different extent in the animals subjected to RNAi. Generate transgenic C. elegans lines expressing this protein tagged with a fluorescent protein and under the control of its respective promoter or a tissue-specific promoter (see Discussion for the choice of an appropriate promoter). Maintain the strain at 15 °C by standard techniques on Nematode Growth (NG) plates seeded with OP50. For example, we chose a worm strain expressing polyadenylate-binding protein (PAB-1) fused at the N-terminus to tagRFP under the control of the pharyngeal muscle promotor pmyo-2. One to two days in advance, prepare NG/carbenicillin (Carb)/IPTG plates with a control (empty RNAi vector L4440) bacteria and RNAi bacteria to inhibit the gene of interest. (For a detailed protocol about RNAi in C. elegans see JoVE Science Education Database. Essentials of Biology 1: yeast, Drosophila and C. elegans. RNAi in C. elegans. JoVE, Cambridge, MA, doi: 10.3791/5105 (2017)). For RNAi treatment from L1, place egg-laying worms onto several separate small NG/Carb/IPTG (6 cm diameter) plates seeded with control RNAi or RNAi bacteria for the gene of interest at 20 °C. Remove the adults after 2 h, keeping the progeny at 20 °C. To avoid developmental defects, RNAi treatments can be started after the L4 larval stage. Once the offspring reaches the L4 larval stage, transfer these L4s onto new NG/Carb/IPTG plates seeded with control RNAi or RNAi bacteria for the gene of interest. Set up nine plates with 15 transgenics each for both conditions and keep them at 20 °C. The aging worms need to be transferred away from their progeny to new plates every second day until the end of their reproductive period in order to be able to distinguish them from their offspring. Evaluate changes in the distribution of the aggregation-prone protein labeled with a fluorescent tag under a fluorescent stereo-microscope with 24x magnification during adulthood, every other day. NOTE: The age-dependent accumulation of the aggregation-prone protein in bright puncta is used as a read-out for aggregation. These puncta should be highly immobile structures to be characterized as aggregates. This should be determined by fluorescence recovery after photobleaching (FRAP) using confocal microscopy. For aggregated protein, no recovery should be observed in the bleached region after at least 4 min5,18. To quantify the changes with age, we scored the distribution patterns in the age-synchronized worms overexpressing PAB-1 at day 2, day 5, and day 7 of adulthood as the following: low aggregation levels (0-10 tagRFP::PAB-1 puncta in posterior pharyngeal bulb), medium aggregation levels (more than 10 puncta in the posterior pharyngeal bulb), and high aggregation levels (more than 10 puncta in the anterior pharyngeal bulb). We used the methods presented here to evaluate how long-lived animals with reduced IIS modulate age-dependent protein aggregation. By Western blot (see step 2.2, Quick insoluble protein extraction for Western blot analysis), we analyzed the total and the insoluble protein content of young (day 3 of adulthood) and aged (day 18 of adulthood) worms on control RNAi and on RNAi targeting the insulin/IGF-1-like receptor daf-2. We observed no large changes in total protein levels with age or between control and daf-2 RNAi conditions (Figure 2A). As expected, we detected a strong age-related increase in levels of highly-insoluble proteins in control animals (Figure 2B). In comparison in the long-lived animals on daf-2 RNAi, aggregation propensity was greatly reduced. 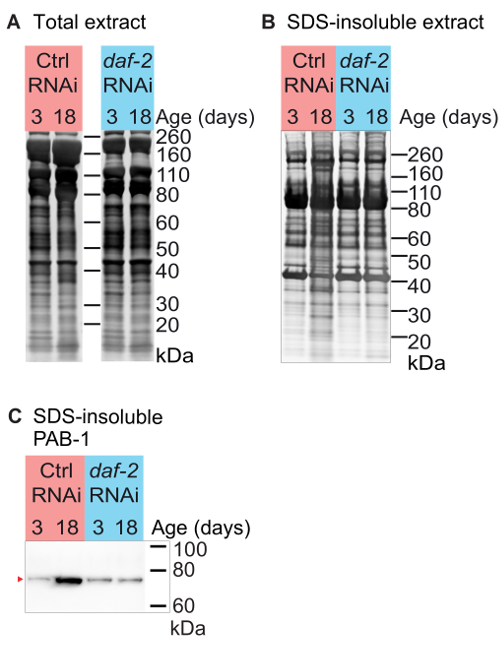 Whole protein staining of the insoluble extracts revealed a less complex protein band pattern in extracts from 18-day-old worms on daf-2 RNAi compared to age-matched controls. Quantitative mass spectrometry analysis demonstrated that long-lived animals with reduced IIS have overall less age-associated protein aggregation and importantly, daf-2 inhibition completely abrogated the age-dependent insolubility of a specific subset of proteins7. To follow-up on these findings, we focused on one of these aggregation-prone proteins, PAB-1. PAB-1 is an RNA-binding protein with a predicted "prion-like" domain. Antibody staining confirmed that long-lived animals maintained PAB-1 soluble with age (Figure 2C). For in vivo analysis of PAB-1 aggregation, we produced transgenic animals expressing tagRFP::PAB-1 in the pharyngeal muscles. In young animals, tagRFP::PAB-1 was mainly diffusely located throughout the pharynx (Figure 3A, "low" aggregation level) but with age, we observed a progressive accumulation in bright puncta starting in the posterior pharyngeal bulb (Figure 3A, "intermediate" aggregation level). During aging, we also observed aggregation in the anterior pharyngeal bulb (Figure 3A, "high" aggregation level) in an increasing number of animals. By grouping animals into these different categories, we scored the rate of PAB-1 aggregation in a population. At day 2 of adulthood most of the worms (88%) had none or very few puncta and no animals with high aggregation levels were detected. Already at day 5, 19% of the population showed intermediate and 16% high aggregation levels, while at day 7 more than 70% of the worms presented intermediate and high aggregation levels. To analyze the effect of longevity on the age-dependent aggregation of tagRFP:PAB-1, we generated transgenic tagRFP::PAB-1 worms with a daf-2 mutation. 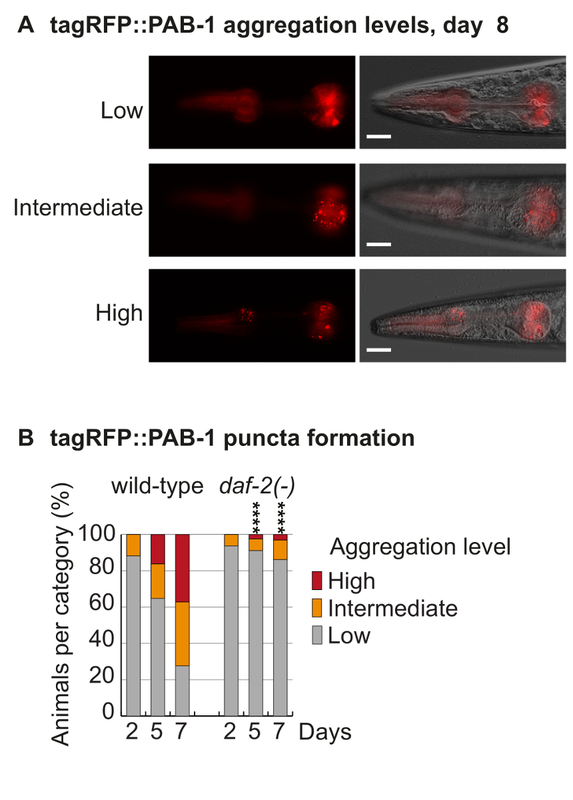 These animals showed significantly reduced tagRFP:PAB-1 puncta formation with aging, with less than 15% of the population exhibiting intermediate and high aggregation levels even at day 7 (Figure 3B). By using the different approaches described here, we revealed that reduced IIS prevents age-dependent protein aggregation to different extents and long-lived animals are particularly efficient in restoring the dynamics of PAB-17. Figure 1: Schematic of the workflow to study changes in inherent protein aggregation with age in C. elegans. Main steps are bold. Please click here to view a larger version of this figure. Figure 2: Protein insolubility increases with age in control animals, but not in animals with reduced daf-2 signaling. (A) Total protein staining of total fraction from day 3 and day 18 gon-2(-) mutants subjected to control and daf-2 RNAi (grown at 25 °C). (B) Total protein staining of SDS-insoluble fraction from day 3 and day 18 gon-2(-) mutants subjected to control and daf-2 RNAi (grown at 25 °C). Panel republished from reference7. (C) Immunoblot detecting PAB-1 in SDS-insoluble fraction, relevant protein bands indicated by red arrow. Panel republished from reference7. Please click here to view a larger version of this figure. Figure 3: Reduced daf-2 signaling prevents the accumulation of tagRFP::PAB-1 puncta with age. (A) Representative pictures of worms with tagRFP::PAB-1 overexpression in the pharyngeal muscles (high magnification microscope, tagRFP detection settings: excitation 558 nm, emission 583 nm). Animals with low (0-10 tagRFP::PAB-1 puncta in posterior pharyngeal bulb), intermediate (more than 10 puncta in the posterior pharyngeal bulb), or high aggregation levels (more than 10 puncta in the anterior pharyngeal bulb) are shown. Scale bar = 20 µm. (B) Quantification of different tagRFP::PAB-1 aggregation levels with age in wildtype and daf-2 mutant background reveals strongly delayed tagRFP::PAB-1 aggregation with age in long-lived animals. Day 2, day 5, and day 7 daf-2(-) versus wildtype background, low compared to intermediate and high aggregation levels: Fisher's exact test, ****p <0.0001. Panel republished from reference7. Please click here to view a larger version of this figure. 50x Protease Inhibitor Cocktail * 2x *Add reagents after taking the amount of RAB stock buffer that is needed (for the extraction for mass spectrometry 6 mL). 100 mM PMSF * 1 mM *Add reagents after taking the amount of RIPA stock buffer that is needed (for the extraction for mass spectrometry 10 mL). Table 1: Buffers for liquid culture, insoluble protein extraction, and dialysis. Here we report a methodology to isolate highly-insoluble protein aggregates from aging C. elegans subjected to RNAi for analysis by mass spectrometry and Western blotting. We show that improving proteostasis by reducing IIS greatly prevents age-dependent protein aggregation. By selecting specific aggregation-prone proteins to overexpress in C. elegans, it is possible to dissect further the mechanisms modulating inherent protein aggregation. This current work is based on the previous findings that protein aggregation is not restricted to specific proteins aggregating in a disease context. By focusing on endogenous aggregation-prone proteins rather than ectopically expressed disease-associated proteins, the expectation is to provide novel insight into physiological regulation of the aggregation process. As age-dependent protein aggregates are found in different cellular locations5, their study should also provide insight into compartment specific quality-control mechanisms. Overall, the mechanisms that control inherent protein aggregation could also be relevant in preventing disease protein aggregation. Of note, although age-dependent protein aggregation resembles in several aspects disease protein aggregation, it still remains unclear whether these aggregates contain amyloid fibrils, a characteristic of many disease aggregates. Compared to a mammalian model, one of the greatest advantages of using C. elegans to study an aging-related characteristic is its very short lifespan. Several hundred proteins consistently become highly-aggregation-prone during aging and this large increase in insolubility is easily detectable even with a simplified biochemical extraction. However, a major limitation of using C. elegans for studying age-dependent protein aggregation is the necessity to isolate large numbers of aged animals. As C. elegans are hermaphrodites and produce approximately 220 or more progeny during their reproductive phase19, it is essential to prevent reproduction or eliminate progeny in order to age a population. Several options are available to induce sterility: One option is to use the chemical fluorodeoxyuridine (FUdR), an inhibitor of DNA synthesis. However, FUdR leads to numerous side-effects including changes in proteostasis and reduced protein aggregation20,21,22. Importantly, FUdR induces genotype-specific responses23. Another option is to use temperature-sensitive sterile mutants. For example, spe-9(hc88), fer-15(b26), fem-1(hc17), glp-1(e2141), and gon-2(q388) have been used previously for mass spectrometry analyses of the age-dependent aggregating proteome5,8. Yet there are several limitations associated with using these mutants. First, as the sterility is temperature-dependent, it is necessary to grow the animals at 25 °C, which constitutes a mild stress and accelerates aging as well as protein aggregation. Conversely, we have observed that gon-2, glp-1 and fem-1 mutants are longer-lived compared to wild-type when maintained at 25 °C (data not shown). Second, there are specific limitations associated with each type of reproductive defect. One disadvantage of using sperm-defective mutants is the production of unfertilized oocytes (also produced in aged wild-type hermaphrodites). The quality of these oocytes greatly declines with age and they accumulate in the gonad24,25. Quantitative mass spectrometry analysis demonstrates that sperm-defective mutants have several fold higher levels of insoluble proteins accumulating with age compared to gonad-less or germline-deficient mutants. This indicates protein misfolding and aggregation located in the gonad5, in agreement with previous studies12,13 and in vivo experiments revealing aggregated proteins located in the abnormal oocyte clusters5. Therefore, excessive protein aggregation in the gonad would mask more subtle changes in protein aggregation in the somatic tissues. This should also be considered when comparing interventions that act to different extents on reproductive and somatic tissue proteostasis. Therefore, to assess only somatic protein aggregation, we favor using gonad-less gon-2 mutants. An alternative would be to use germline-deficient glp-1 mutants. However, we note that these animals have less inherent protein aggregation with age compared to gon-2 mutants5. This is likely a consequence of improved proteostasis in somatic tissues due to signaling from the germline-defective gonad26,27,28. Another alternative is to use wild-type animals and remove progeny every day by sedimentation. However, this is problematic due to the difficulty of completely removing all progeny. Another general limitation of using C. elegans is its small size which makes specific tissue extractions challenging. As such whole animal extractions do not provide relevant information related to how different conditions modulate protein aggregation in specific tissues. Of note, this issue could potentially be circumvented by using a recently developed method based on fluorescence-activated cell sorting to isolate specific cells from C. elegans29. Yet it remains to be determined whether this method would be suitable to obtain sufficient material for insoluble protein extraction and whether it would be applicable to aged animals. Alternatively, tissue specific protein aggregation and its regulation can be investigated by additional in vivo experiments. As transgenic animals expressing a fluorescently-labeled aggregation-prone protein of choice can be rapidly generated and as the animals are transparent, it is relatively easy to examine protein aggregation in situ. Overall, it is essential to follow up the proteomic results with in vivo experiments in a wild-type background. The combination of a biochemical and microscopy-based characterization enables a comprehensive study of protein aggregation and an assessment of the role of genes of interest. The latter is facilitated in C. elegans by RNAi mediated through feeding and the availability of whole genome RNAi libraries. In addition, a large number of characterized mutants exist to confirm results obtained by RNAi or to use instead of RNAi. As highly-aggregated proteins make up only a small fraction of total proteins, it is necessary to start the extraction with a large number of animals. With large quantities of insoluble proteins, it is then feasible to perform extensive peptide fractionation to reduce sample complexity for mass spectrometry and thus improve identification of lower abundant proteins. If only small amounts of insoluble proteins are required, an alternative is to grow worms on plates and homogenize them with ceramic beads. One of the disadvantages of liquid culture is that in the case of a contamination, the whole culture is affected and must be discarded. In general, C. elegans aging is strongly influenced by temperature and this parameter must be tightly controlled in the liquid culture to avoid variations in age-dependent protein aggregation. Temperature control is also essential to obtain a homogenous population of gonad-less animals when using the gon-2(-) mutants. Depending on the goal of the study, it is important to consider different extraction methods. The biochemical extraction presented here was initially adapted from protocols to isolate disease-associated aggregates11,30,31. We chose relatively high concentrations of detergents such as 0.5% SDS to isolate the more insoluble aggregates. Also by pelleting the 0.5% SDS insoluble aggregates with low centrifugal speeds, this protocol would only isolate the larger aggregates. Alternatively, a less stringent protocol was recently published10. In this study, more soluble and smaller aggregates were also extracted by omitting SDS and by using very high centrifugal speeds at 500,000 x g. A comparison of the different protocols shows a general increase in the number of proteins in the aggregating proteome using the less stringent protocol7. We note that long-lived animals with reduced daf-2 signaling efficiently prevented the accumulation of both SDS-soluble and SDS-insoluble aggregates in gonad-less animals7. When constructing transgenic models for following age-dependent protein aggregation, it is relevant to consider in which tissue to overexpress the aggregation-prone protein of interest and at which expression levels. We favor expression in tissues located in the head region to avoid interference with autofluorescence, which is prominent in the aging intestine. To visualize fluorescent-labeled aggregates with low-magnification, the aggregation-prone protein should be expressed at a relatively high level. On the other hand, too high expression will cause the aggregation-prone protein to form aggregates already in young animals. Taken together, these methods will help us to understand why part of the proteome aggregates with age and ultimately lead to the development of strategies promoting healthy aging. Balch, W. E., Morimoto, R. I., Dillin, A., Kelly, J. W. Adapting proteostasis for disease intervention. Science. 319, 916-919 (2008). David, D. C. Aging and the aggregating proteome. Frontiers in genetics. 3, 247 (2012). Hartl, F. U., Bracher, A., Hayer-Hartl, M. Molecular chaperones in protein folding and proteostasis. Nature. 475, 324-332 (2011). Ayyadevara, S., et al. Age- and Hypertension-Associated Protein Aggregates in Mouse Heart Have Similar Proteomic Profiles. Hypertension. 67, 1006-1013 (2016). David, D. C., et al. Widespread protein aggregation as an inherent part of aging in C. elegans. PLoS biology. 8, 1000450 (2010). Demontis, F., Perrimon, N. FOXO/4E-BP signaling in Drosophila muscles regulates organism-wide proteostasis during aging. Cell. 143, 813-825 (2010). Lechler, M. C., et al. Reduced Insulin/IGF-1 Signaling Restores the Dynamic Properties of Key Stress Granule Proteins during Aging. Cell reports. 18, 454-467 (2017). Reis-Rodrigues, P., et al. Proteomic analysis of age-dependent changes in protein solubility identifies genes that modulate lifespan. Aging cell. 11, 120-127 (2012). Tanase, M., et al. Role of Carbonyl Modifications on Aging-Associated Protein Aggregation. Scientific reports. 6, 19311 (2016). Walther, D. M., et al. Widespread Proteome Remodeling and Aggregation in Aging C. elegans. Cell. 161, 919-932 (2015). Lee, V. M., Wang, J., Trojanowski, J. Q. Purification of paired helical filament tau and normal tau from human brain tissue. Methods in enzymology. 309, 81-89 (1999). Goudeau, J., Aguilaniu, H. Carbonylated proteins are eliminated during reproduction in C. elegans. Aging cell. 9, 991-1003 (2010). Zimmerman, S. M., Hinkson, I. V., Elias, J. E., Kim, S. K. Reproductive Aging Drives Protein Accumulation in the Uterus and Limits Lifespan in C. elegans. PLoS genetics. 11, 1005725 (2015). Uno, M., Nishida, E. Lifespan-regulating genes in C. elegans. Npj Aging And Mechanisms Of Disease. 2, 16010 (2016). Sulston, J. H. The Nematode Caenorhabditis elegans. Cold Spring Harbor Laboratory Press. 587-606 (1988). Maine, E. M. RNAi As a tool for understanding germline development in Caenorhabditis elegans: uses and cautions. Developmental biology. 239, 177-189 (2001). Rauniyar, N., Yates, J. R. Isobaric labeling-based relative quantification in shotgun proteomics. Journal of proteome research. 13, 5293-5309 (2014). Brignull, H. R., Morley, J. F., Garcia, S. M., Morimoto, R. I. Modeling polyglutamine pathogenesis in C. elegans. Methods in enzymology. 412, 256-282 (2006). Fay, D. S. Classical genetic methods. WormBook. 1-58 (2013). Brunquell, J., Bowers, P., Westerheide, S. D. Fluorodeoxyuridine enhances the heat shock response and decreases polyglutamine aggregation in an HSF-1-dependent manner in Caenorhabditis elegans. Mech Ageing Dev. 141, 1-4 (2014). Angeli, S., et al. A DNA synthesis inhibitor is protective against proteotoxic stressors via modulation of fertility pathways in Caenorhabditis elegans. Aging (Albany NY). 5, 759-769 (2013). Feldman, N., Kosolapov, L., Ben-Zvi, A. Fluorodeoxyuridine improves Caenorhabditis elegans proteostasis independent of reproduction onset. PLoS One. 9, 85964 (2014). Davies, S. K., Leroi, A. M., Bundy, J. G. Fluorodeoxyuridine affects the identification of metabolic responses to daf-2 status in Caenorhabditis elegans. Mech Ageing Dev. 133, 46-49 (2012). Luo, S., Kleemann, G. A., Ashraf, J. M., Shaw, W. M., Murphy, C. T. TGF-beta and insulin signaling regulate reproductive aging via oocyte and germline quality maintenance. Cell. 143, 299-312 (2010). Andux, S., Ellis, R. E. Apoptosis maintains oocyte quality in aging Caenorhabditis elegans females. PLoS genetics. 4, 1000295 (2008). Vilchez, D., et al. RPN-6 determines C. elegans longevity under proteotoxic stress conditions. Nature. 489, 263-268 (2012). Ghazi, A., Henis-Korenblit, S., Kenyon, C. A transcription elongation factor that links signals from the reproductive system to lifespan extension in Caenorhabditis elegans. PLoS genetics. 5, 1000639 (2009). Shemesh, N., Shai, N., Meshnik, L., Katalan, R., Ben-Zvi, A. Uncoupling the Trade-Off between Somatic Proteostasis and Reproduction in Caenorhabditis elegans Models of Polyglutamine Diseases. Front Mol Neurosci. 10, 101 (2017). Kaletsky, R., et al. The C. elegans adult neuronal IIS/FOXO transcriptome reveals adult phenotype regulators. Nature. 529, 92-96 (2016). Kawarabayashi, T., et al. Age-dependent changes in brain, CSF, and plasma amyloid (beta) protein in the Tg2576 transgenic mouse model of Alzheimer's disease. The Journal of neuroscience : the official journal of the Society for Neuroscience. 21, 372-381 (2001). Kraemer, B. C., et al. Neurodegeneration and defective neurotransmission in a Caenorhabditis elegans model of tauopathy. Proceedings of the National Academy of Sciences of the United States of America. 100, 9980-9985 (2003).